An oversized version of Demitasse's coffee siphons brews iced coffee by the window. Editor’s Note: This is the first in a new series on local restaurants and businesses. To make a suggestion for a future story–whether about your own coffee shop or just a ramenya you love–send an email to [email protected] We love hearing from you! Now in its seventh month, Demitasse has become a neighborhood staple, and it’s earned a regular following, including one particular customer who regularly brings cuts of fresh fish to her favorite barista. Whatever the chalkboard says, the shop’s gleaming siphons and locally roasted beans put Demitasse in completely different league from the green mermaid giant. Owner Bobak (“Bobby”) Roshan, a self-described coffee nerd, and I sit across from each other at a bench in the back corner of the shop, and over the clinks, beeps, and hums of cups and machinery, he revisits the naissance of Demitasse. The dream began during Roshan’s stint as a lawyer at a firm in Century City, where, he says, there was no coffee. “We started bringing in our own beans and grinders and stuff like that and it kind of just became an obsession in our little office.” Soon, the lawyer began fantasizing about turning his obsession into a living. In August 2011, Demitasse opened its doors. Despite Roshan’s great expectations, it remained relatively empty at first. But over time, people began to trickle in, curiosity aroused by the promise of coffee made in a glass bubble, or by the good-natured threat on the chalkboard outside. The shop bustles in the afternoons now, representing all cross-sections of the neighborhood: government workers, Little Tokyo community members, and those unlucky draftees out to ease the sting of being summoned for jury duty at City Hall down the street. At the counter inside, roasted beans in little apothecary bottles sit in a line in front of the register. The “aroma bar” serves as a sensory menu, showing off the current selection of drinks. Most newcomers to Demitasse are unfamiliar with the siphon method of brewing. That is, except for the other coffee nerds and those who remember seeing siphons in coffee shops in Japan, where the glass instruments are still much more popular than they are here. “A lot of people just want to know what the hell that weird contraption is,” says Roshan over the hum of a grinder. The coffee siphon (also called the “vacuum coffee pot”) dates back to 1800s Berlin, but fell out of popularity in Europe around the mid-20th century. The “weird contraptions” are now most popular in Asia, and Demitasse’s siphons, like much of their other equipment, comes from Japan. When I ask about the Starbucks slogan outside, Roshan laughs before launching into a comparison of the two cafes’ methods. They’re mostly the ones you’d expect: Starbucks batch-brews black coffee, over-roasts beans to ensure a uniform (if bitter) flavor, and creates espresso drinks with a fully automated machine, while Demitasse baristas grind to order, tamp their own espresso beans, and steam their own milk. Demitasse features coffees from independent roasters across California, varying from the larger Handsome Coffee to the smaller Trystero’s, “which is a guy roasting in his house.” Depending on the month, customers can also expect beans from Portola’s, Augie’s, Equator, and more. Roshan’s coffee nerddom shows in the myriad ways Demitasse continues to find to express its creativity and enthusiasm. From a Hangover Cure drink set at New Year’s to rotating barista signature drinks only available during their namesake’s shifts, to Sunday crepe brunches and monthly “cuppings” (tastings) of new offerings, Demitasse ardently celebrates coffee, and the neighborhood cafe experience. 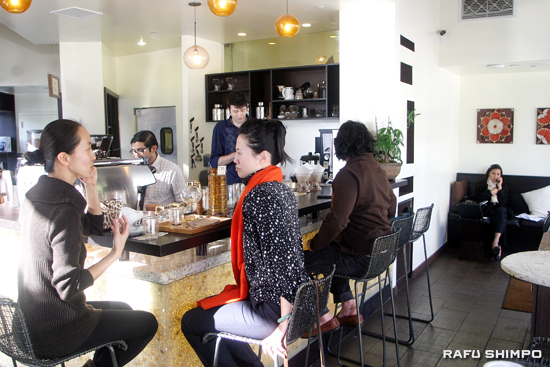 Built for conversation: Demitasse's coffee bar ensures no barrier between baristas and customers. Even the structure of the shop’s interior itself was built with intention to make customers feel closer to their baristas, and to their coffee. “This bar is actually heavily influenced by sushi bars. I was in San Francisco once at this place called Sebo. You sit up at the bar and you talk to the chef and he tells you what about the fish and what you’re eating and why it’s fresh and where it comes from. I thought, This is what coffee should be like. To stay up-to-date on events at Demitasse, check out their Facebook page. For 1 hour of free parking with validation, park in the Kajima lot, entrance on San Pedro.